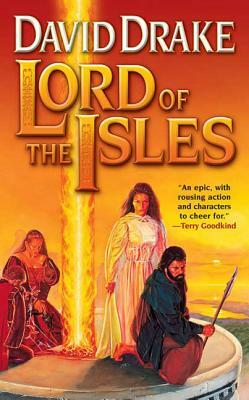 With Lord of the Isles, David Drake returns to fantasy with a towering and complex epic of heroic adventure in an extraordinary and colorful world where the elemental forces that empower magic are rising to a thousand-year peak. In the days following an unusually severe storm, the inhabitants of a tiny seaport town travel toward romance, danger, and astonishing magic that will transform them and their world. David Drake (born 1945) sold his first story (a fantasy) at age 20. His undergraduate majors at the University of Iowa were history (with honors) and Latin (BA, 1967). He uses his training in both subjects extensively in his fiction. David entered Duke Law School in 1967 and graduated five years later (JD, 1972). The delay was caused by his being drafted into the US Army. He served in 1970 as an enlisted interrogator with the 11th Armored Cavalry Regiment, the Blackhorse, in Viet Nam and Cambodia. He has used his legal and particularly his military experiences extensively in his fiction also. David practiced law for eight years; drove a city bus for one year; and has been a full-time freelance writer since 1981, writing such novels as Out of the Waters and Monsters of the Earth. He reads and travels extensively.